An intelligence source claimed the terror group’s chief was hiding out in Rawa, northwestern Iraq, when troops entered Qaim some 50 miles away near the Syrian border. 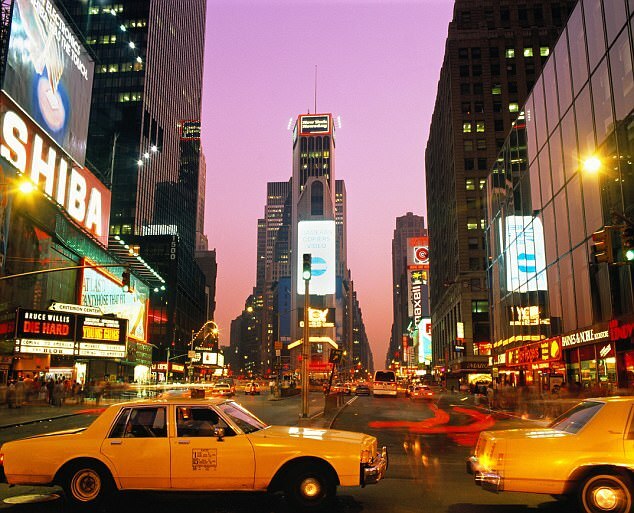 Al-Baghdadi felt his presence in Rawa ‘threatened his life’, so he scampered over the border to Deir ez-Zor in a vehicle synonymous with the western world of New York City. The source was quoted by the Iraqi Media News Agency in Iraqi News as saying: ‘After Iraqi troops invaded Qaim, Baghdadi was aware that his presence in Rawa threatens his life. Al-Baghdadi urged the remaining ISIS fighters in Qaim to carry on fighting the Iraqi troops, but the source said they ‘let him down and escaped in their personal cars to Syria’. ISIS released a new audio recording in September purporting to be of Al-Baghdadi. The 46-minute audio recording was published by the Al-Furqan news organisation, which is affiliated with ISIS, and came after Russia claimed to have killed Baghdadi in an airstrike on Raqqa in June. 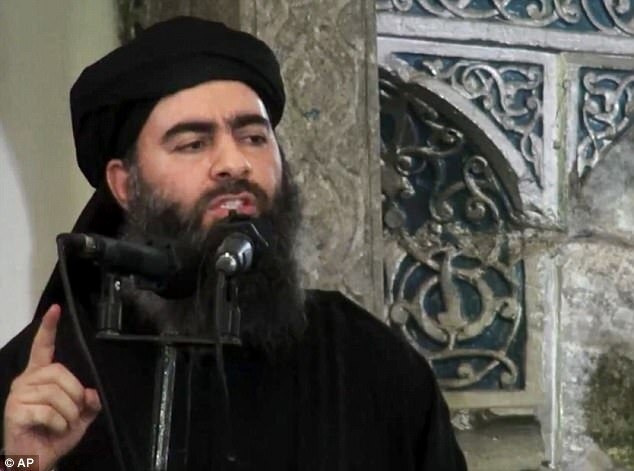 The previous time Baghdadi was heard on tape was back in November 2016 as the battle for Mosul was starting, in which he urged followers to fight the ‘unbelievers’ and ‘make their blood flow as rivers’. US-backed forces subsequently drove ISIS out of Mosul, it’s last stronghold in Iraq and the city from which Baghdadi declared his so-called Caliphate in 2014. ISIS destroyed the ancient al-Nuri mosque, from which Baghdadi gave the speech, before the city fell. That speech also marks the last time that Baghdadi was seen in public. Allied forces have since surrounded Raqqa, in Syria, which acted as ISIS’s de-facto capital and was another possible hiding spot for Baghdadi. Officials then believed he was likely hiding somewhere in the sparsely populated desert between these two cities, predicting it could take years to locate. US Army Lt. Gen. Stephen Townsend, who commands the coalition forces fighting ISIS in Iraq and Syria, said in September he believed Baghdadi is still alive. Speaking to reporters at the Pentagon over video-link from his headquarters in Baghdad, Townsend said: ‘Do I believe he’s alive? Yes. Russian officials said in June there was a ‘high probability’ that al-Baghdadi died when one of their airstrikes hit a gathering of ISIS commanders on the outskirts of the Syrian city of Raqqa. However, come July, the Kremlin admitted that it was struggling to confirm that Al-Baghdadi had died, and both Western and Iraqi officials have remained skeptical. In August, Kurdish counter-terrorism official Lahur Talabany said he was 99 per cent sure that al-Baghdadi had simply gone into hiding. 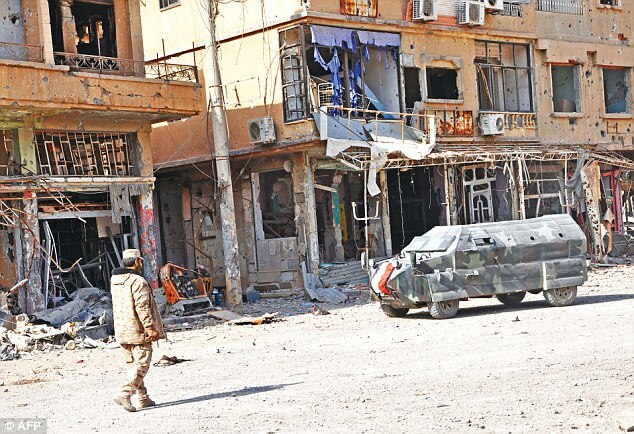 On the weekend, Syrian and allied forces converged Saturday on holdout ISIS group fighters in the Syrian border town of Albu Kamal, the jihadists’ very last urban bastion following a string of losses. And Al-Baghdadi may have to re-think his strategy because on Friday, Russian-backed Syrian regime forces took full control of Deir ez-Zor, which was the last city where ISIS still had a presence after being expelled from Hawija and Raqa last month. The borders of a ‘caliphate’ that three years ago spanned territory in Iraq and Syria roughly the size of Britain further shrank on IS’s surviving fighters when Iraqi forces retook Qaim, also on Friday. The town lies along the Euphrates River in western Iraq and faces Albu Kamal, where many of IS’s remaining fighters are thought to have regrouped. The Syrian army and allied militia groups were still some 30 kilometres (nearly 20 miles) from Albu Kamal, but Iraqi paramilitaries crossed the border to take on ISIS, the Observatory said. 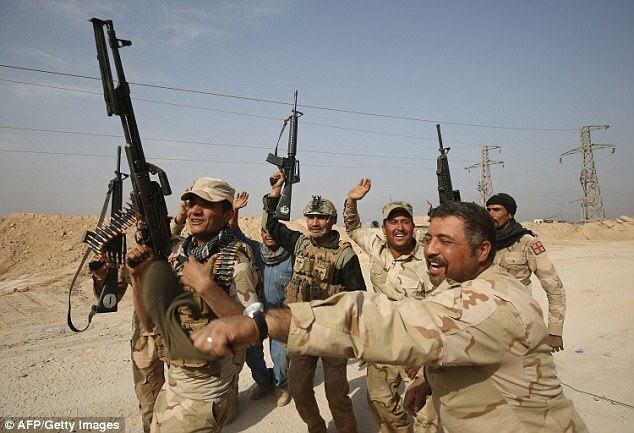 ‘Fighting pitted Hashed al-Shaabi units against the Islamic State in the Hiri area,’ said Rami Abdel Rahman, who heads the Britain-based monitor. Hiri, just across the border from Qaim, on the outskirts of Albu Kamal, is now the last town of note still fully controlled by Abu Bakr al-Baghdadi’s jihadist group.